Turn your Instant Pot to saute, hot. Allow to preheat until hot. Spray with canola spray. Saute ground beef, onion, bell pepper, and garlic until no pink remains. Add kidney beans, chili powder, and cumin to the pot and stir. Pour diced tomatoes and tomato sauce on top. Do not stir in. Put on the Instant Pot lid, lock, and turn the knob to sealing. Press the "Bean/Chili" button and set to 20 minutes. If you don't have a Chili button, use the manual or pressure cook button set to high for the same amount of time. Once the cooking cycle completes, allow to natural release for at least 10 minutes and then quick release the remaining. Open and stir. Optionally top with your preferred chili additions such as grated cheese, sour cream, or green onions. Serve with corn bread if you have it. I usually try to limit my salt so I buy low or no salt added tomatoes, broth, and beans. Season as your prefer. 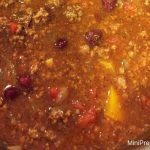 If you prefer a hotter chili, increase the chili powder and cumin.